This is the back side of a feathered shield, made in pre-Hispanic times and covered, on the front, with multi-colored feathers. Feathered shields were luxurious items used by Aztec warriors in military displays and parades. This one, created about the time of the Spanish conquest, is one of the few such perishable objects to survive. As a gift for someone who would never see the New World, this shield would have been both a marvel and a curiosity in Europe. The King of Spain and his court, their families and high-ranking members of the Catholic Church all received feathered gifts from conquistadors and friars in New Spain. Often these works displayed precious materials, fine craftsmanship, or as is the case here, both. The two loops were meant for an Aztec warrior to slip the shield on his forearm. The circular wooden frame gives the shield its basic form, and serves as its primary support. The vertical splints lend structural support to the shield even though they are very lightweight. The feathered tassels were attached behind tufts of fur, creating a layered and complexly textured appearance from the front. The craftsman of this shield was highly skilled. The materials he used were both expensive and highly valued. Painted images of feather-workers and written descriptions of their craft are known from the late 16th century (including one in Vistas). This shield, however, is one of the actual objects that can reveal how pre-Hispanic craftsmen actually worked. 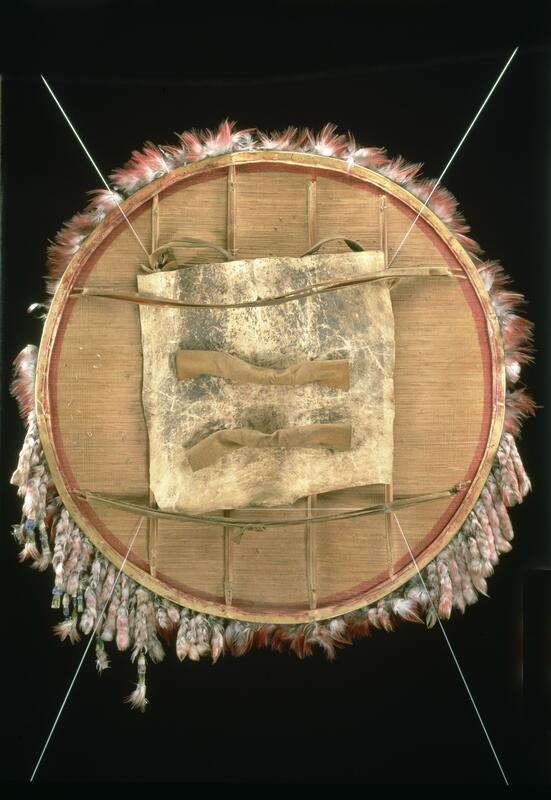 The shield’s support is made of reed splints, lashed together with rope and reinforced by pieces of wood. 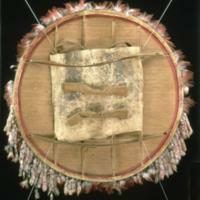 The back also shows two rawhide loops, for carrying the shield across one’s forearm. Paper made from agave covers the front of the shield and provides a base for the feather decoration. As a gift for someone who would never see the New World, this shield would have been both a marvel and a curiosity in Europe. The King of Spain and his court, their families and high-ranking members of the Catholic Church all received feathered gifts from conquistadors and friars in New Spain. Often these works displayed precious materials, fine craftsmanship, or as is the case here, both. Anders, Ferdinand. 1978. “Der altmexikanische Federmosaikschild in Wien.” Archiv für Völkerkunde 32: 67-88. Clendinnen, Inga. 1991. Aztecs: An Interpretation. Cambridge and New York: Cambridge University Press. Feest, Christian. 1990. “Vienna’s Mexican Treasures. Aztec, Mixtec, and Tarascan Works from 17th-century Austrian Collections.” Archiv für Völkerkunde 44: 1-64. Filloy Nadal, Laura, and Moreno Guzmán, María Olvido. 2017. “Precious Feathers and Fancy Fifteenth-Century Feathered Shields.” In Rethinking the Aztec Economy, edited by Michael Ernest Smith, Frances F. Berdan, and Deborah L. Nichols. Tucson: The University of Arizona Press,156–94. Pasztory, Esther. 1983. Aztec Art. New York: Harry N. Abrams. Russo, Alessandra. 2011. "Cortés's Objects and the Idea of New Spain." Journal of the History of Collections 23 (2): 229-252.